Misslette, The Singing Cowgirl is a rare find. She's a guitarist, and singer who plays harmonica when needed. Now comes her EP "HOWDY Y'ALL" which is a six-cut gem (actually 13 when you count the 2 poems and the 11 songs, medleys included) packed with perfect melodies for the campfire. A poet at heart, Misslette, The Singing Girl opens with "I'm A Cowhand In My Heart." 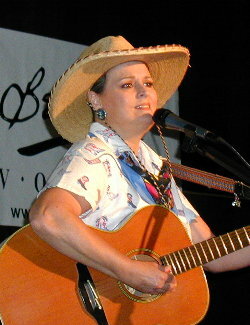 Then, Misslette, The Singing Cowgirl breaks into song with music as comfortable as a well-worn saddle. I have this overwhelming urge to grab a blanket and curl up around the fire. Misslette, The Singing Cowgirl winds flawlessly through the classic "Ghost Riders In The Sky" and winds up with three medleys of music and poetry that will keep you wanting more. 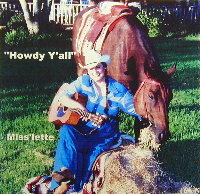 If you're a cowboy poet fan, and love great cowboy music, you'll be a fan of Misslette, The Singing Cowgirl. She's a genuine representation of all that is good about that music out on the lonesome plain. Get it today for $13.99 and support this fabulous art form. 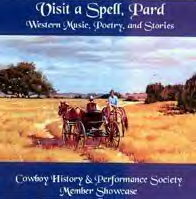 "Back In The Saddle (Yodeling)" from "Howdy Y'all"
"Ghost Riders In The Sky" from "Howdy Y'all"
"Bury Me Not On The Lone Prairie" from "Howdy Y'all"
"I'm A Cowhand In My Heart" from "Howdy Y'all"
"Red River Valley Medley" from "Howdy Y'all"